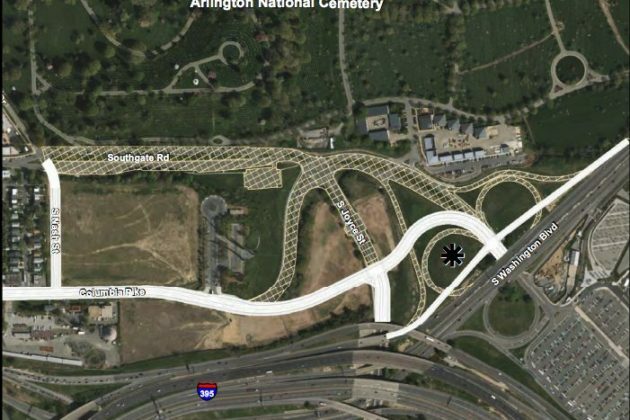 Bicycling advocates are blasting newly revealed plans to simultaneously expand Arlington National Cemetery and realign Columbia Pike, arguing that the proposed changes could make cycling along the roadway more dangerous. 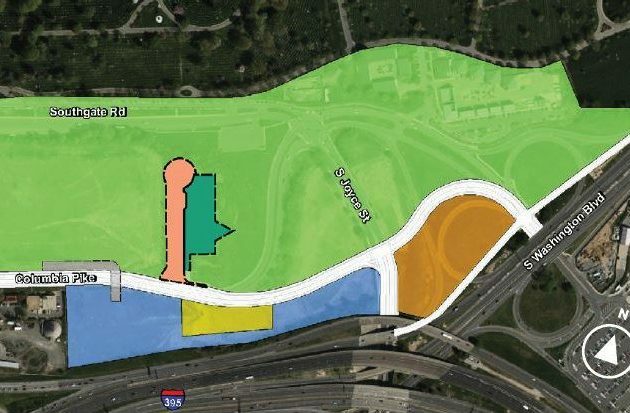 In a message to its mailing list, the group urged concerned cyclists to speak in opposition to the cemetery’s plans at a public meeting on the subject in Pentagon City tonight (Wednesday). The organization, founded by county transportation commission chair Chris Slatt, is primarily concerned that the cemetery only plans to add a 10-foot-wide sidewalk along the pike’s north side when it realigns the road. Army officials are currently hoping to add space for as many as 60,000 new interments to the cemetery’s south, absorbing the former Navy annex site and several other acres of land controlled by the county near S. Joyce Street and Washington Blvd, prompting some changes to the pike in the area. The project also calls for the removal of Southgate Road in its entirety as it runs through area, which Slatt’s group describes as “a relatively quiet street that cyclists currently use to avoid that stretch of Columbia Pike.” The organization has made improving conditions for cyclists on the pike a central part of its mission, and it’s warning that eliminating an alternative to biking along the road would be a major step backward for the area. “The alignment for the future Columbia Pike has the necessary geometry for a high capacity regional multimodal transportation corridor,” the corps wrote. The corps wrote that planners also considered building the “wall trail” along the cemetery’s eastern boundary as part of this work, a bit of cycling infrastructure long hoped for by county officials to link the Foxcroft Heights neighborhood to Memorial Avenue. Yet the corps said it determined that it “appears to have severe space constraints due to aboveground utilities along the proposed route,” and didn’t consider it any further. Tonight’s meeting on the project is scheduled for the Sheraton Pentagon City hotel (900 S. Orme Street) from 5-8 p.m. The Army expects roadway construction associated with the expansion could start as soon as 2021.